← There’s a “Y” in Tuscaloosa! 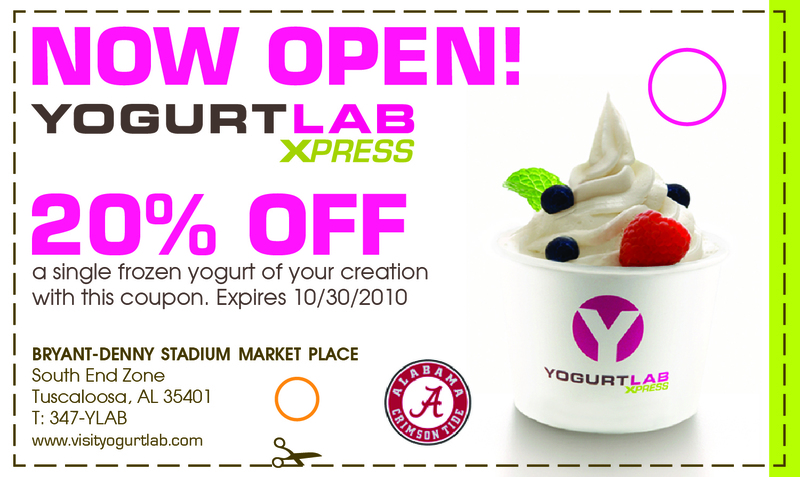 We’re thrilled to announce the grand opening of YogurtLab Xpress at 10 a.m. on Tuesday, September 28th, in the Bryant-Denny Stadium Market Place! To celebrate the occasion, we’re offering 20% off a single frozen yogurt of your creation at YLX when you present the Alabama Crimson Tide coupon on grand opening day through October 30th. Thousands of coupons have been distributed and are circulating on The University of Alabama campus. You can find them (or they’ll find you!) in campus buildings and in sorority and fraternity houses on campus. Or, you can print the coupon right here and present it at YLX to redeem your 20% discount. We’ve put our frozen yogurt flavors to the test and think you’ll agree they’re the best this side of the SEC! Here are just a few of our favorite pairings: Red Velvet Cake and nonfat Alpine Vanilla are a winning combination as the Crimson Tide Twist. Dulce de Leche and Reese’s Peanut Butter Cup are simply sublime! Mountain Blackberry and New York Cheesecake (both nonfat) are a match made in heaven. Then there are our Tuscaloosa toppings–the options are plentiful, but here are just a few more reasons to experiment often: Hounds Tooth Mix (white and dark chocolate chips), fresh fruit, pretzels galore, Oreo crumbs, “puppy chow,” hot fudge and toasted coconut. We’re also proud to offer some of the same exclusive toppings that are customer favorites at YogurtLab in Vestavia Hills: Selma Good Chocolate Chip Cookie Dough, Cafe IZ All Natural Granola and Ashley Mac’s Strawberry Cake. On behalf of all of us at YLX, we look forward to serving The University of Alabama students, faculty, fans and the Tuscaloosa community. Twelve fabulous flavors … loads of toppings … a creative, stylish environment that encourages experimentation and inspires community … that’s how we roll! 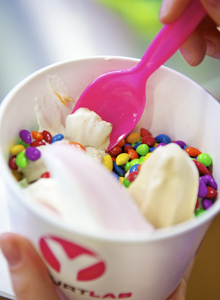 A self-serve frozen yogurt destination for families, friends and froyo lovers. Here, 16 fabulous flavors and over 40 select and exclusive toppings come together in one cool place. We like to call it "a culture like no other" where we encourage experimentation of our premium product line in a hip, creative environment that inspires community.